The origin of poutine was a humble mistake. However, the dish has evolved to include many unique variations and ingredients in kitchens throughout eastern Canada. 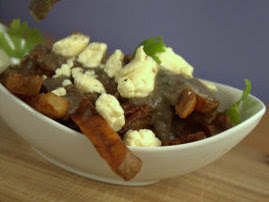 Purists, if such a thing truly exists might argue that the fries must be cooked in lard or other animal fat renderings, but we’re a long ways away from Quebec and my goal was to make a poutine that is completely vegetarian but delicious in it’s own right. 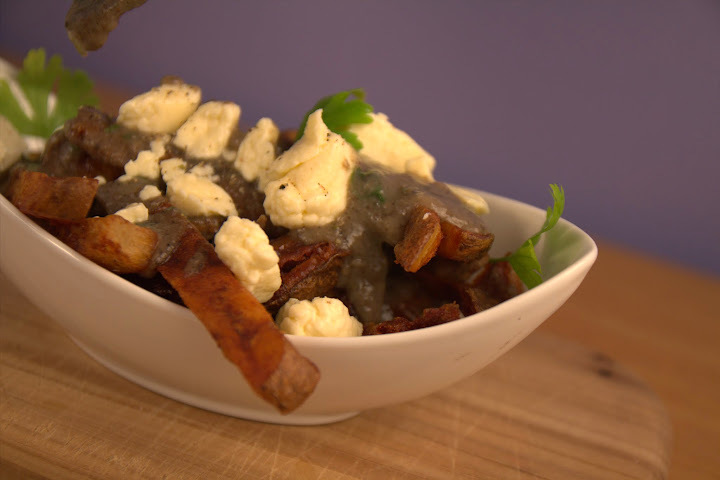 The fries are triple cooked and the gravy is made with a mushroom base and topped with local cheese curds. I’m not going to lie, this poutine is awesome. I also want to note, this method is time consuming. There are plenty of other ways to go about frying a potato, but my method creates an ultra crisp exterior with a semi-hollow soft interior. It’s an incredibly pleasurable texture. Most importantly though, please make sure to crack open a delicious beer or two when you enjoy this dish. Peel potatoes, cut into thick Julienne shape. Blanch in 200 degree water for 4 minutes. Transfer to ice water bath, let dry on a wire rack, and freeze for one hour. Fry in 275 oil. Wait until lightly browned about 6-8 minutes. Remove from oil and dry immediately on a wire rack over a pan with a paper towel. Briefly fry a 2nd time at 325 until perfectly browned. About 1-2 Minutes. Repeat the process and clean oil off with fresh towel. Lightly brown Onions and mushrooms for 5-7 minutes on medium heat. Add minced garlic and lightly brown on medium heat. 2-3 minutes. Transfer to blender or food processor and blend mixture to make smooth. Put back in Pot over medium heat. Make roux(1 part flour 1 part butter) by slowly stirring in the 2T of flour into lightly melted butter. Melt and stir over medium-low heat in a separate small pan until paste consistency. Mix in roux into the stock mixture over medium heat and stir until gravy consistency. Take the pot off the heat and mix in Fresh Parsley, Thyme, Rosemary, salt and black pepper to taste. Barsh, Russel L., and James Y. Henderson. "The Supreme Court's Van der Peet Trilogy: Naïve Imperialism and Ropes of Sand." McGill Law Journal (1997). Print. Gollner, Adam L. "The Cheeses of Warwick." Maclean's Canda's Weekly Newsmagazine 12 July 2004. Print. López-Alt, J. Kenji. "The Burger Lab: Why Double Fry French Fries?." Serious Eats. Serious Eats, n.d. Web. 15 June 2014. 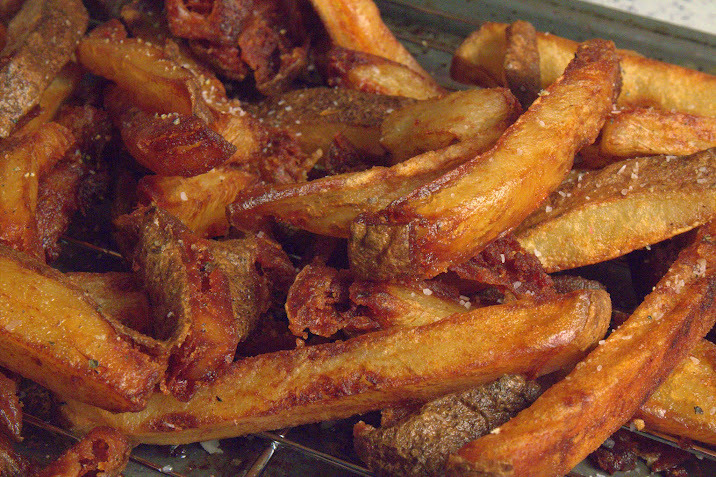 Path: http://aht.seriouseats.com/archives/2010/01/the-burger-lab-why-double-fry-french-fries.html.